Something strange and unexpected has been happening on the outskirts of Bishop Auckland this summer. For each of 14 late evenings, ending in mid-September, some 8,000 people have been descending on the hitherto unremarkable County Durham town to witness a spectacle, the like of which does not exist this side of the Vendée, in western France. It was France, of course, that pioneered the son et lumière concept of telling a historic story against the illuminated backdrop of a historic building. 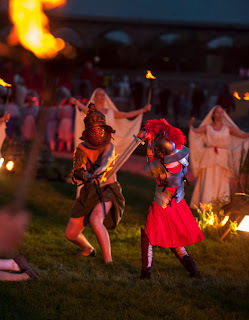 The huge Puy du Fou medieval theme park, in the Vendée, is the venue for night-time spectaculars that are a dramatic, animated elaboration of the original humble son et lumière concept. Not before time has this crepuscular drama crossed the Channel, and the result is mightily impressive, drawing as it does on expertise built up over the years in the Vendée. The result is Kynren: an epic tale of England. The multi-million pound Kynren evokes the Anglo-Saxon word, cynren, which loosely translates as “our people”. I was unsure quite what to expect at Bishop Auckland and was probably rather more bowled over by it all than I had anticipated. It begins with the process of actually getting to the specially-created 8,000-seat venue on the edge of town – 8,000 people means, after all, a lot of cars and special buses! So the sense of occasion is already building in the early evening for a show that will only begin as the sun waves goodbye, which is a lot later in northern England in mid-summer than it ever is in France! So the logistics should be challenging, but the organisation is such that it all seems remarkably effortless. Very friendly guides eased our passage down the avenue towards the grandstand, where a wide array of food and drink options generated excited chatter. Queuing was minimal, and that goes for the loos too, whose numbers seemed to have been carefully planned to match demand. The show itself takes place before a wide “stage”, which accommodates a fantastic variety of “props”. Well, props isn’t a word to really do it all justice, because by props I mean elaborate backdrops that rise from invisible vents in the ground, or from the lake that extends most of the width of the set. The spectacle begins as night falls, with the illuminated chapel of Bishop’s Palace atop the hill over the river providing the perfect atmospheric backdrop, complemented by the appearance of Saturn and Mercury in the south-west, ahead of the stars. The “epic tale” is portrayed through person of a young lad who kicks a football through the widow of the Bishop’s residence and then slips through a portal to an earlier age. He encounters Roman soldiers, Vikings, and Normans, with acts of derring-do en route to the Industrial Revolution and two World Wars. All is told with on eye on the region’s particular local history. The secret, in watching, is not to get too caught up in a literal appraisal of the show as a history lesson, but rather to enjoy every moment of the visual spectacles. Some of them are, quite simply, stunning and if you never thought it would be possible to assemble a competent cast of more than 1,000 volunteers, then think again! These are drawn from across County Durham, but such is the extent to which Kynren has captured the public imagination, that some travel from as far afield as Kent. For all the grandeur of the battlefield scenes, the Roman army, chariots et al, among my personal favourite moments were with the sheep stampeding in remarkably well-trained fashion across the length of the set, and a parade of similarly well behaved geese. With the arrival of autumn comes the conclusion of a first and hugely successful summer of spectacles – organisers Eleven Arches promise further innovations and the possibility of a longer series of shows next summer, details of which will be announced on December 1. Kynren is the biggest show to happen in England since the Olympic opening ceremony and it happens thanks to the largesse of philanthropist Jonathan Ruffer, who is effectively regenerating Bishop Auckland and reinventing it as a centre for Christian heritage from his own (quite deep) pockets. I'm looking forward to interviewing Jonthan i nthe coming weeks and getting astronger insight into what makes him tick. The impact of good works, however, is already evident, as the town – set to become a centre for appreciation and study of the role of Spanish art in religious history – already bears a more confident air, and boasts newly refurbished pubs and small hotels. With visitors reportedly arriving from China and the USA it will need them!